Northwest Electrical Services was contracted by Bermuda Electric Light Co (BELCO) in the Hamilton Bermuda Generating Station to supply a Brackish Water / Seawater treatment plant to supply process water to the diesel and steam generating units in their central Hamilton Power Station. Bermuda relies on rainfall for freshwater supply and the increase in power generating capacity has led to an increased need for treated process water within the station. The plant had been utilizing trucked potable water at considerable cost for make-up water. 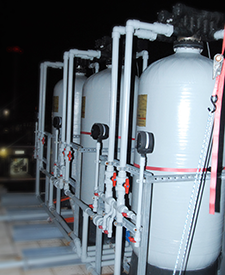 This potable water, had not met the water quality specifications for the equipment resulting in accelerated corrosion of engine components and increased maintenance cost. The project included the specification, procurement and supply of a turnkey brackish water and ground water seawater treatment, electronic de-ionization system, back-up resin bed de-ionization, water storage and distribution systems integrated with existing generator control and monitoring systems. Aside from the packaged RO/DI units Northwest Electrical Services LLC also designed and installed the control systems and operator interface for monitoring of the RO/DI processes, tank levels, flushing and automatic tank makeup distribution and pump / pressure controls. 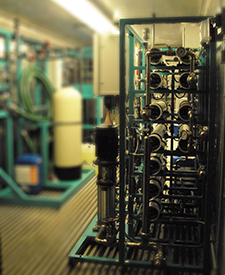 The system was placed into service July 2011, resulting in near boiler quality process water greatly reducing the corrosion within the equipment and an expected ROI in less than 18 months when compared to delivered potable water.